In 2015 O'Reilly started using badges with passive RFID (radio-frequency identification) tags to improve the experience of attendees at our events. We recognize that technical people, like you, are acutely aware of the security and privacy concerns associated with poor use of technology. We're playing our cards face up as we explore this new toolset. This document describes our use of RFID tags. If you have any further questions or concerns, or you just want to opt out, please visit the Customer Service desk at Registration. Your RFID tag has a unique ID number embedded in it, which is designed to be read by the tag readers located at various points throughout the venue, such as at the entrances to session rooms, hallways, and in the Expo Hall. The unique ID number is associated in our system with the information you provided when you registered for the conference. These are passive RFID tags, so the tag's unique ID number is received only when you happen to pass a reader as you move through the venue. Accurate session counts - with RFID tags, it's easy for us to monitor each session's popularity, and in aggregate, the popularity of a given subject. This helps inform subject matter decisions and select an appropriately sized room for similar sessions at future events. More feedback - if you spend more than 5 minutes in a given session and have the mobile app installed, we'll prompt you to rate the session. This makes it easier to give us feedback which allows us to fine tune the program. Easier trip reports - when you or your employer invest in attending a conference, you want to make sure to get as much value from it as possible. Many people choose to write trip reports, but the personal schedule you make ahead of time rarely matches reality, which makes writing trip reports more difficult. 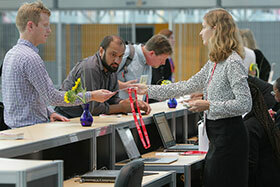 With RFID badges, you'll have an accurate log of the sessions you actually attended. Quickly revisit sessions - many attendees use our video recordings after the conference to revisit their favorite sessions and retrieve key details. With an accurate log of the sessions you attended, you can quickly locate the session recording you're looking for. The first rule of user experience is "no surprises" and we think that applies to attendee experience, too. We respect your privacy and are being cautious with how we use RFID tags. While we work with third-party technology providers, we will not share any data obtained through our use of RFID with outside parties for purposes not related to O'Reilly. You are free to share your info by allowing an event sponsor or exhibitor to scan your badge. For more information, please see our RFID Policy. Thank you for allowing us to make your conference experience even more awesome.